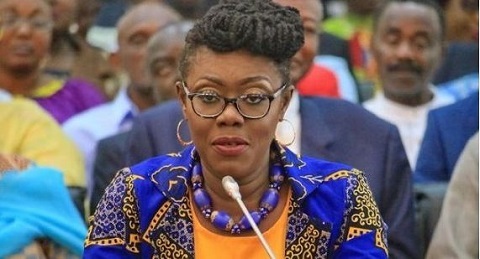 Communications Minister Mrs Ursula Owusu-Ekuful has taken the opposition National Democratic Congress (NDC) to the cleaners for criticising government over its decision to purchase a building for a chancery in Oslo,Norway at a cost of $12 million. The decision, which has since been suspended, brought arguments and counter arguments between government and the main opposition party. Latest to slam the Minority is the Minister who in a Facebook said, the NDC does not have the moral right to criticise the NPP because the Mahama led administration used $14 million to construct a building for the VicePresident. ‘’These NDC people saw nothing wrong with spending 14 million US dollars of the tax payers money building 1 house for the vice president in Ghana, where the cost of living is much less than Norway, and refused to pay allowances for nursing and teacher trainees. It is very funny for them to complain about this Oslo property. What Joyce Bawa and her kind refuse to accept is that no one has denied that government had every intention of buying that property and had made that clear till the Foreign Minister’s attention was drawn to that newspaper article and she put a hold on this transaction. No consideration has passed. No money has been paid for the purchase price. None of the conditions precedent had been completed. There was no valid contract. This is basic contract law!!! What did she learn in law school? These NDC people saw nothing wrong with spending 14 million US dollars of the tax payers money building 1 house for the vice president in Ghana, where the cost of living is much less than Norway, and refused to pay allowances for nursing and teacher trainees. It is very funny for them to complain about this Oslo property. President Akufo-Addo is fixing their mess and solving the problems they saddled all Ghanaians with! John Mahama wants to come again to continue his create loot and share agenda??? We shall see. He should learn from his friend Good Luck!! God is blessing our homeland Ghana under the principled, purposeful, inspired leadership of Nana Akufo-Addo, and is making Her great and strong in our time and for the future. Leadership is cause, everything else is effect. We saw how the NDC brought Ghana to its knees and destroyed everything they touched. Never again should they be allowed to ruin our country again.